The Panerai Pam 49 Luminor Marina is an excellent example of refined craftsmanship and functionality. A COSC certified automatic movement is situated in a 40MM, cushion-shaped brushed stainless steel case with a high-polished bezel. The luminescent white dial is distinct and eye-catching. It features a date calendar at 3 o’clock, anti-gare sapphire crystal and a fully protected crown guard. It features two strap options: black alligator strap or a black rubber strap perfect for diving and outdoor activity. 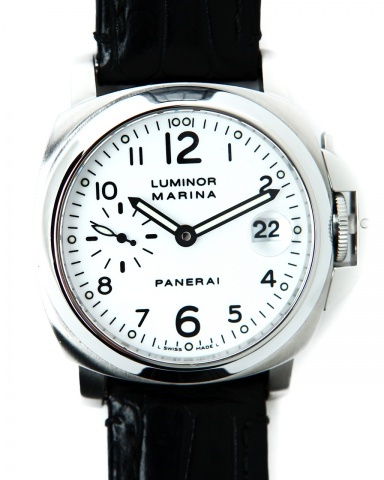 Water Resistant to 300 Meters, this contemporary Panerai watch is an ideal candidate for any watch collection.